← Are you the one who makes the t-shirts? There are pleasant surprises. In my experience, it seems like most are not so pleasant. We moved into our house in 1984, when I was 7 months pregnant for Anna. Our house is called “the Blink house” in our little village, as it was built over 90 years ago by the family that owned the local lumber yard. There is a lot of oak, most painted over. Some not. I have stripped down to the oak trim in the bedroom that was Sara’s and Anna’s, (it was just painted around the window), and in the upstairs bathroom. I’m planning to strip the paint on the woodwork in the room that was Ben’s, getting ready to move our bedroom downstairs. I painted the outside of the house in 1988, and have picked away at repainting for the last 9 years. I’ve painted two bedrooms twice, ours once. When my brother-in-law replaced the flooring, toilets, and vanity in the bathrooms, I painted those rooms. We changed the sunroom/playroom to Tom’s office, and I painted that. I’ve painted the kitchen walls, and am slowly working on the cupboards. We’ve had the old fuse box changed to circuit breakers, and the furnace and water heater replaced with new that doesn’t need a chimney to vent to, and the roof replaced. I’ve learned a lot about minor repairs, I can glaze windows, caulk, sand, and research what I don’t know how to do. My brother-in-law has helped with the big projects that are beyond me. When Junior redid the upstairs bathroom flooring, he found a big, not so good surprise. A former bathroom remodel had made a mess of the floor supports, and it was a big headache to repair. When the sunroom was repainted, we also pulled up the ugly rainbow shag carpet and linoleum, and Junior sanded and refinished the floor. My nephew said he didn’t think it was hardwood. We could see the oak under the edge of the dining room carpet. Since I always thought the sunroom was an afterthought (the sunroom, back half of the kitchen, and half bath don’t have a second story above them), I didn’t think that much of it at the time. Well, the living room and dining room carpet are getting quite old, so this winter I finally started pulling up carpet, and then, yes, linoleum in the dining room, to refinish the floor. 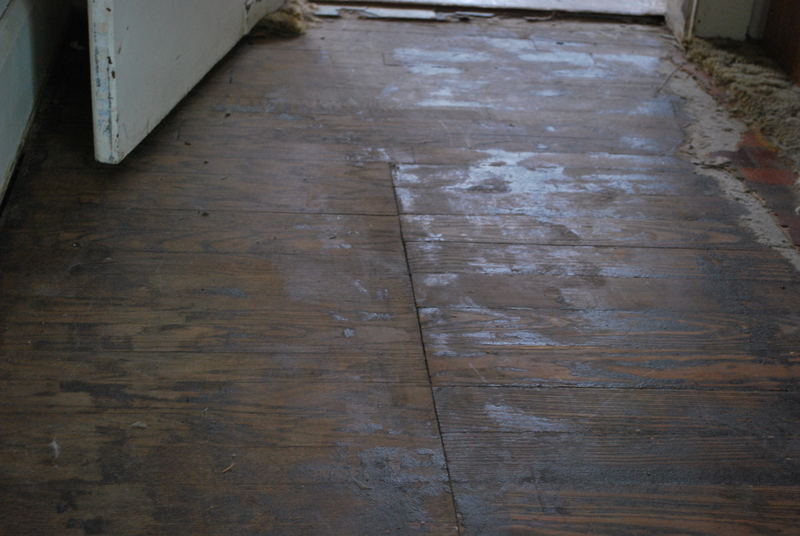 Hardwood is much easier for Tom to go over in his wheelchair, and can be refinished rather than replaced like carpet. Per Junior’s recommendation, I cut the carpet in strips, rolled it up, and taped it. The rolls were much easier to put in the trash. I pulled up the linoleum, and got out the Krud Kutter to clean off the paper backing and glue. This is where the next not so good surprise came, and I can’t blame it on a bad remodel. The oak boards are only in the 18″ perimeter of the room. The center is the same wider boards as the sunroom, that “not hardwood” as Doug had said. Why would the owner of the lumber yard be so cheap? It was pre-depression, their own home, and they got the wood wholesale! I did some research, and found that as hardwood flooring became popular, a softer, cheaper wood was used for the center of the room. 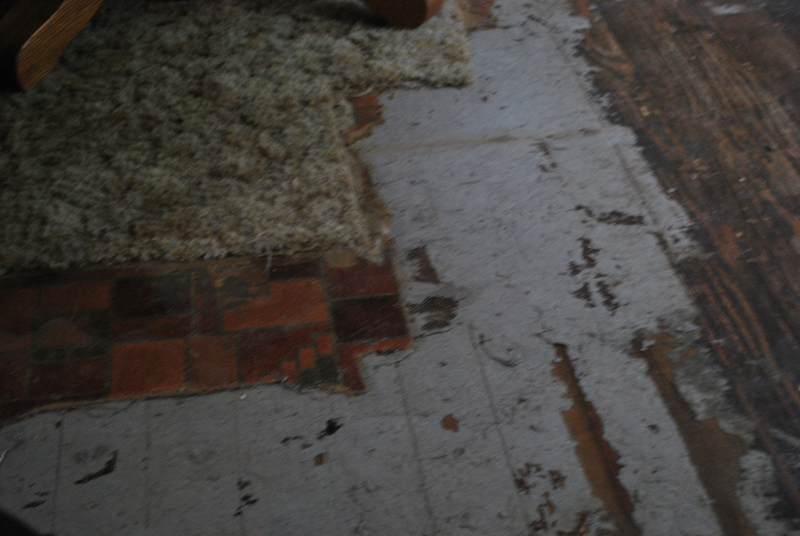 This was covered with a fiber or linoleum rug, and only the hardwood border was seen. I’m glad plywood wasn’t invented until 1928, or it would probably be in the center of the room. I’ve decided to make the most of this. We’ll either refinish it all the same, and this will be part of the character of the house; finish the softer wood center by painting a pattern on it; or refinish it all but put a rug over the odd center. This entry was tagged family, remodeling. Bookmark the permalink. I have a friend who actually kept that center wood bit, but stained it differently so it looks really intentional. He had cherry stain to the edges and a really light pale stain to the center. Worth considering! I didn’t realize you had seen this before! That is kind of what I was thinking of when I said paint the center. I have seen pictures of a patterned “carpet” painted on a wood floor.